It appears Ford at least took inspiration for the quote from Walden by Henry David Thoreau. 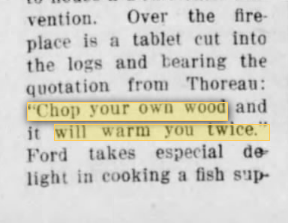 In a 1916 edition of The St. Louis Post-Dispatch, the phrase hung over Ford's fireplace is attributed as a quote from Henry David Thoreau. Every man looks at his wood-pile with a kind of affection. I love to have mine before my window, and the more chips the better to remind me of my pleasing work. I had an old axe which nobody claimed, with which by spells in winter days, on the sunny side of the house, I played about the stumps which I had got out of my bean-field. As my driver prophesied when I was plowing, they warmed me twice—once while I was splitting them, and again when they were on the fire, so that no fuel could give out more heat. 1819 Kinloch Letters 1.460: The proverb of the country is, that wood warms a man twice. Barbour 65: Firewood. The peasant who sets out for that purpose [to collect fuel] of a winter's morning from his house in the valley, begins by ascending some neighboring mountain, and having there made up the pieces he has cut into the form of a rude sledge, and secured them together properly on the brink of the declivity, he takes his station on the load, so that he can touch the ground at pleasure with his feet, and committing himself to a narrow, winding, slippery path, and frequently of beaten snow, and generally bordered from [place to place by precipices, he gets back to his family with almost aerial velocity. Others again, who live on the top of some naked hill, and who cannot find a declivity suitably gentle to admit of their using a sledge on the mountain where wood is to be obtained, are obliged to throw it down the precipice, at the bottom of which they afterwards collect and carry it home on their shoulders. The proverb of the country is, that wood warms a man twice. Whether Thoreau was familiar with the expression from Kinloch's Letters or whether he formulated his version of the expression independently is unclear. Searches of nineteenth-century and earlier collections of English proverbs do not turn up anything very similar. But the notion that wood heats its gatherer twice has been in published English since at least 1819 (when Thoreau was two years old) and perhaps in proverbial use before that. Whiting's reference to Barbour seems to be to Frances Barbour, Proverbs and Proverbial Phrases of Illinois (1965), but I don't have access to that book. The close coincidence of the loose paraphrase attributed to "my driver" in 1854 (Walden) and the more concise phrasing attributed to "Mr. Knight at different periods" in 1855 (Thorn Cottage) renders any conclusions as to the source of the original suspect. It is noteworthy, however, that both these early print uses are from works produced by authors living in Massachusetts (Concord and Rowley). In the popular press, the first print uses I found appeared in 1862 (US) and 1867 (UK). Their context again suggests a possible prior origin in 'received wisdom'. In the latter, UK instance, for example, the saying is ascribed to the grandfather of the speaker, while the source of the earlier US instance is a serialized fiction called Wash Wilbur the Frontier Hunter, by William H. Bushnell. The Sun (New York, New York), 14 Feb 1862, Page 4 (paywalled). South London Press, 24 August 1867, Page 5 (paywalled). Further research revealed an earlier, 1808, publication of the proverb, in a form ascribing the double warming not to cutting the wood, but rather to gathering it and getting it home. The earlier publication was in the December 10, 1808 edition of The Port Folio (see text midway down first column), a Philadelphia newspaper edited at that time by 'Oliver Oldschool, Esq. ', a pseudonym of Joseph Dennie. The text was later (1819) edited and reprinted as Letters from Geneva and France. Not the answer you're looking for? Browse other questions tagged etymology quotations or ask your own question. Where does English get the word “condom” from? If quoting only an extract of dialogue from a fiction book, do you still need to have quotes within quotes? What was the origin of the phrase “15 minutes of fame”? When was “fo' sho'” first used in print, television, or music? Or, better yet, when was it standard southern slang? What does word «zippo» means in American slang?